Tall straight tree with a dense crown. Grows on deep soils with good drainage from sea level to c.600m. Is absent from poorly drained sites, dry sites and highly infertile soils.Generally frost and drought resistant, but this is strongly related to provenance. One of the most important hardwoods; used for pulp production and for a wide range of construction and manufacturing purposes. Useful in providing high-level shelter (up to 50m) in windbreaks. Its dense foliage provides useful shade. Suitable for planting for the commercial production of sawlogs. Also a possible hardwood pulp species. Large quantities of cream-coloured pollen is yielded producing a mild flavoured honey. Nectar feeding birds are attracted to the blossom and rosellas are attracted to the capsules and seed. The blossom provides food (pollen) for many native insects, which in turn attract insect-eating birds. The seed and fruit are eaten by some native birds. 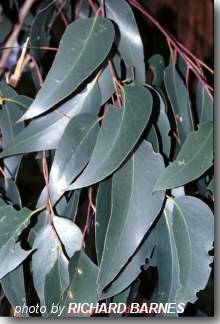 The leaves are used for dyes.Koori (mainland) use: Fibre from inner bark used to make coarse string for bags and fishing nets. Outer bark for tinder. Not suitable below powerlines. 6-8 weeks to pricking out. Seed germinates best at 21oC. Seedling may not survive in a sterile potting mix. Problems can be overcome by adding local soil or leaf litter.Smoke treatment may improve germination *Dry stored in refrigerator at 3-5oC.